8 Months - Holiday Hair! First of, let me apologise (again) for going awol (again). I've had a rough couple of weeks with this pregnancy and the whole Hyperemesis Gravidarum nightmare. Needless to say between struggling in to work and looking after my family, I haven't had much energy to blog. I have however been doing lots of thinking and self-exploration and when I'm back to myself, I should have a few good posts for you! And no - I haven't forgotten about the reviews I promised you way back in November - I just have to add the photos and write them up properly. I had hoped to publish them before xmas so you could try the products as stocking fillers but my illness being as it was - I wasn't able to - sorry. Hopefully, you can look at them in the January sales or for Valentines? Enough of the chit chat - I think you need some SL photos. So here we go. With my temples growing in and the rest of the hair growing like crazy I treated myself to a 'salon visit'. 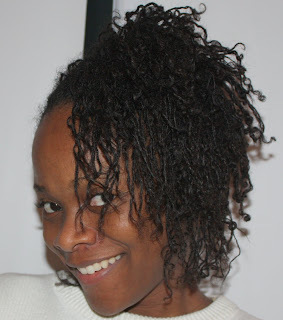 I headed to 'Hair by Chi' in Leyton (yes, I actually ventured North of the river for something other than work lol!) I had a really relaxing time, just chatting to the (male) hairstylists about locks and love and life (my favourite subjects of course) and just whiling time away. Fabulous! Oh and I've started using fractionated coconut oil (which is incredibly light) and sweet almond oil on my scalp to help treat the dry scalp that has popped up with this cold weather. 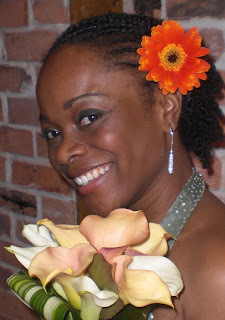 Who would have thought from the smile on my face in this photo (taken in March 2008 at a friend's wedding) that I was hiding a 'shameful secret'. I had bald patches at the back of my head. 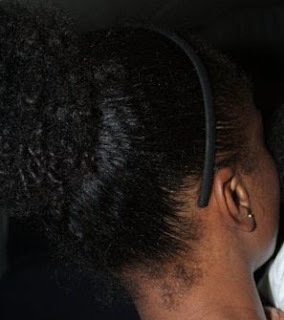 Luckily for me (and my pride), the patches were small enough to allow them to be cleverly concealed when wearing an afro or a ponytail but time was running out. Two days prior to this, my loving husband had pointed out that yes, the patches were not only growing larger - they were growing towards each other (to form one large patch) and a new patch had also appeared. I was devastated. 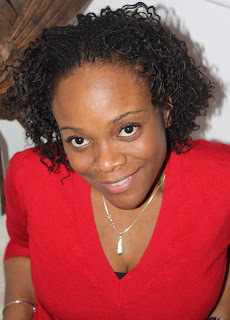 It all started in 2007, shortly after we'd returned to London after a relaxing holiday in St Lucia, I gave myself a BC (big chop) and rocked a boyish cut or an 'all off' (which I often hear referred to as a TWA (teeny weeny afro) by my North American sistas. I can't remember liking this too much but HRH loved it! My last haircut was at the beginning of end of March. 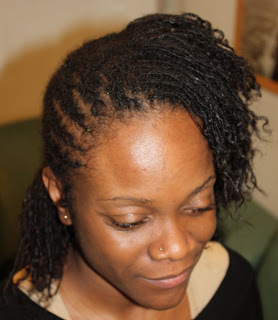 One afternoon while twisting my natties, my sister-in-law poked her finger into a bald patch on my head and asked "Hey gal, wheh yuh hair gawn?" (She's Trinidadian). I was shocked, because I hadn't even realised the hair had gone. All I know is that the spot she poked had been itching a bit for a while but had stopped. Imagine my surprise when I placed my finger over the place she referred to! It was absolutely smooth, like a baby's bottom. Completely hairless. I was flummoxed. However, I assumed it would grow back, maybe the hair loss was a result of the injury I'd sustained back in early February. This had left me bed-bound for 3 weeks and unable to walk for 3 months. Maybe the stress had taken its toll??? Weeks passed and another dime sized patch joined the first - still at the back of my head but on the other side. The rest of my hair continued to grow around them. It's funny that I waited almost a year before discussing it with my GP (General Practitioner). She poked her finger in the spots and chuckled YES she laughed at me : "You've been stressed" (How would she know?) "Stop worrying about it, it may grow back!" 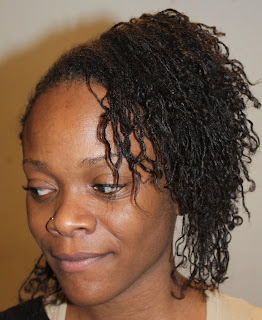 Here I was, no chemicals in my hair, no braid, no stress (at least so I thought), a regular at my gym, health conscious etc and I was losing my hair. 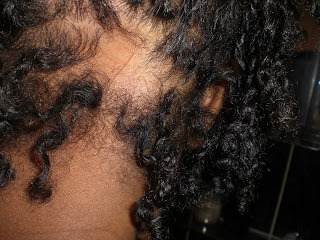 Welcome to the world of Alopecia Areata. This was just one of the patches but you can see the progression over time. If the twist on the left had been down you would be able to see quite clearly a definitive 'line' or gap from my left ear to my right, as if someone had shaved me. *sigh* It's still painful to look at these pictures, even though comparatively my case may not have been as severe as some women e.g. GAIL PORTER! I felt ugly and pathetic and wore variations of the same hairstyle all the time so that noone would see my shame. It is such a painful thing to go through, so I truly understand when people mention their struggles with PCOS or Fibrods and their links to alopecia. For me, my story had a happy ending. 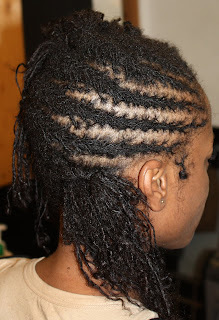 When I became pregnant in March 2008, my body kicked started the hair growing phase (as usually happens with pregnant women) and not only did my hair experience a growth spurt, my bald patches filled themselves in. Many people have laughed at this photo (on my Facebook) cos I look like a crazy woman but really I was pretty thankful with how it looked because I knew what it had looked like before! There was a bald patch the size of my fist where now you can see wispy wavy hair. 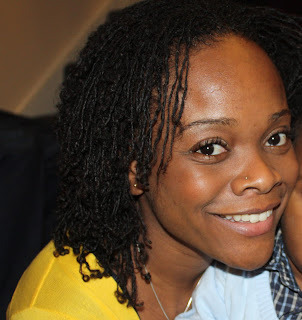 Through the misery of the hyperemesis gravidarum, I had to thank my son for giving me back my hair! I did wonder whether the alopecia would return as soon as he was born, and I continued to worry about it for several months afterwards but he's a year old now and you can't tell where my patches were. I think I stopped worrying the day I went to my SL consultant for my install. 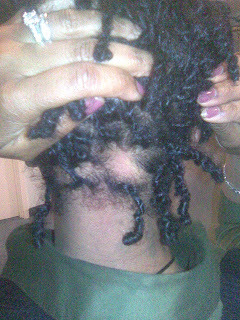 I warned her she might find some short or scanty hair in the back of my head because it was growing back from a session of Alopecia. She just seemed confused. Later she said to me - there was no difference in length or density behind there, so she didn't know what I was talking about it. Hallelujah! So not only did my hair grow back, filling in the bald patches, it grew to a length similar to that of the existing hair and therefore blended right in! Well almost, she did mention a section of poker straight hair that just wouldn't stay in the SL pattern - (so she had to knot the ends) - and I have since plait them because they kept unravelling but I am NOT COMPLAINING. 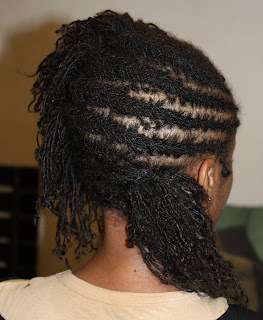 Last shots of the back of my head before I got locked up (March 2009). 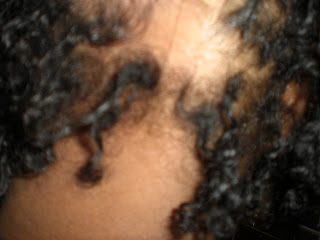 So, this is how I feel about Alopecia Areata. 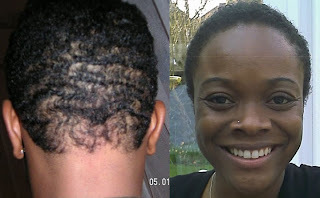 Ladies, if you suffer from it, know that there is hope - however slight, your hair MIGHT grow back. I was lucky, pregnancy worked for me. I realise that's not always an option (*grin*) and noone can really relate to the pain or embarrassment you're going through - except those who've been there. I don't have all the answers, just want you to be encouraged that there COULD be a happy ending for you too. Oh and if you're in London, head over to the Belgravia Centre, it's worth a try. Y'all know how HRH is with taking photographs of my hair, so these are the best I have (2 out of 20 lol) I'm unknowingly pulling faces in most of the others - so we'll just leave them where they are! These ones are washed and braided. See? A little more 'oomph' to it, don't you think? Ok guys, I'm back. Thanks for your patience. I have been reading, just not writing... but I am back. This blog is entitled 'Love, Life & Locks': I've recently added 'London' to the end since I discovered another blogger who started their SL journey around the same time I did, was also publishing to a similar title. I don't know whose blog was first but no offence was intended on my part, so I've amended mine. I've been blogging for about 3 or 4 years now, I have an anonymous blog (that shall remain so) and this one muhahah. I like the outlet it gives me to get stuff off my chest and to simply share my thoughts with whomever might be interested. Love, Life and Locks... hmmmm, I haven't blogged much about LOVE here though (despite title) and that's because my beloved is a rather a private man and prefers to keep our (HIS) business to himself :) My nickname for him is HRH (His Royal Highness ) because he really does act like a King (yup, a royal pain in the .. Just kidding!) He acts like a King and most days I treat him like one, which is fine cos he treats me like a Queen and that works for us. 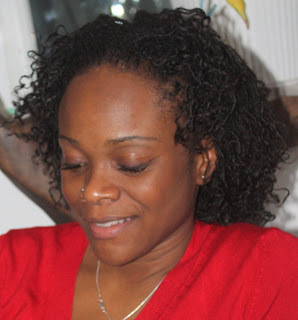 To celebrate my son's first birthday, I wore a braid out. The prep was pretty simple. I washed my hair (SL shampoo) then made 6 large braids; 1 either side of my head, 2 braids at the top, and 2 french braids down the back. 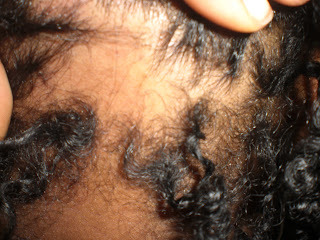 Once dry, I covered my hair with my beloved loc soc and went to bed. When I undid the braids the following afternoon and finger combed my hair, HRH did a double take and actually paid me a compliment! 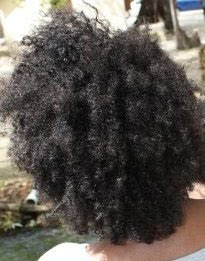 I must admit, braid outs give me oodles of volume. I look like I have loads of big bouncy hair! I walk with an extra spring in my step, humming away about 'walking on sunshine' even though it's 4 degrees and grey outside; enjoying the way the wind blows through my hair. And I don't think my afro loved the wind this much! 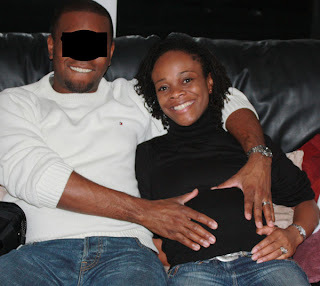 It is obvious that my husband and I so thoroughly enjoyed having our son that we decided to have another one. I mean, what other explanation could there be for doing this madness again? 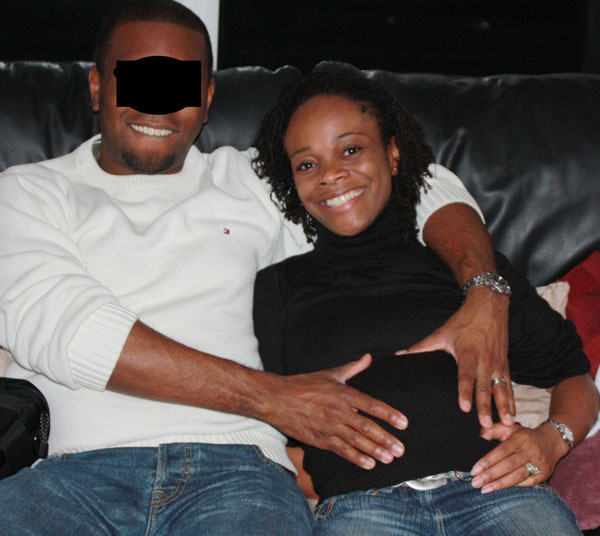 Yes, that's right, Bajan Lily is pregnant; our two youngest will be 18 months apart - which will be fine when they're older than 2 but bodes for a rather interesting journey in between. What also scares me is the effect this will have on my hair - why? 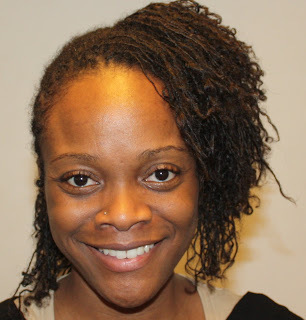 Well, I have shared with you the mystery that was my hair falling out at the front shortly after my SisterLocking session; my angst and panic as I watched locks thin at the root; and my despair as some fell off. I am now in the recovery phase (I'll take some photos to show you). 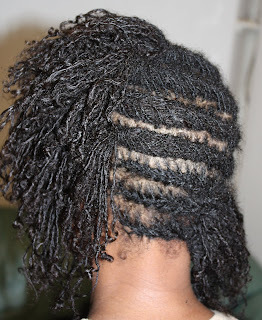 Basically, if you look at the the base of those 'fragile' locs, you will see a fairly stout healthy root... an inch or two up and you come across a skinny skinny skinny section (where the hair had come away from the root) and travelling onwards towards the end of my hair you will again find a fairly thick section. Kinda like an hour glass with an elongated abdomen... so my hair has recovered and is growing strong again. Guess I'll keep you posted.